SKALE Labs Inc today announced the launch of SKALE DevNet, a production quality sidechain test network that will act as a secure, developer friendly testing environment leading up to the SKALE Mainnet launch in Q3 2019. Following the launch, developers at this week’s ETHDenver Hackathon will be able to run Ethereum dApps on the SKALE DevNet in a fully integrated manner with Ethereum and other related Web3 infrastructure and tooling. DevNet is available upon acceptance into SKALE’s Innovator Program, and the SKALE team will be sponsoring four prizes for developers choosing to leverage their platform during the hackathon. With SKALE, any dApp developer familiar with Amazon EC2 or Google Cloud can seamlessly access fast, secure, and cost-effective smart contract execution. SKALE also provides easy to understand documentation and plug-and-play code snippets to help developers build applications rapidly. As a testament to the power of SKALE, the team has built out an S-Chain-based rock-paper-scissors demo, with moves settling in a matter of microseconds. Despite some confusing initial announcements, SKALE’s current architecture has no association with the Plasma design space. Rather, SKALE provides Ethereum developers with the opportunity to launch application specific sidechains, with security derived from a distinct network of validators than the main chain. SKALE’s CEO, Jack O’Holleran views alternative scaling solutions, like variants of Plasma and Generalized State Channels, as complementary to sidechains, noting that each solution provides its own distinct set of advantages and disadvantages. Sidechains, for example, are considered most appropriate for computationally heavy and low value use cases, whereas value heavy and computationally light transactions work better with State Channels. Over time, O’Holleran expects some sort of consolidation between these various categories, with SKALE hoping to integrate support for Plasma in later iterations of their product. Ethereum is no stranger to sidechains, with Proof of Authority (PoA) Network having launched late December 2017. However, as the name suggests, Proof of Authority is not a permissionless network – the validator set is made up of public and pre-approved figures. As such, PoA has significant trust assumptions, with applications ultimately subject to censorship. By contrast, SKALE offers developers a permissionless sidechain with a variable, randomly-assigned set of validators, protecting against potential acts of censorship or malfeasance that arise when validators can easily collude amongst each other. O’Holleran eventually expects SKALE to tap into PoA’s feature set, offering developers the ability to determine parameters relating to the number of nodes and the open or closed nature of the validator set. Likewise, future iterations of SKALE will offer privacy features. 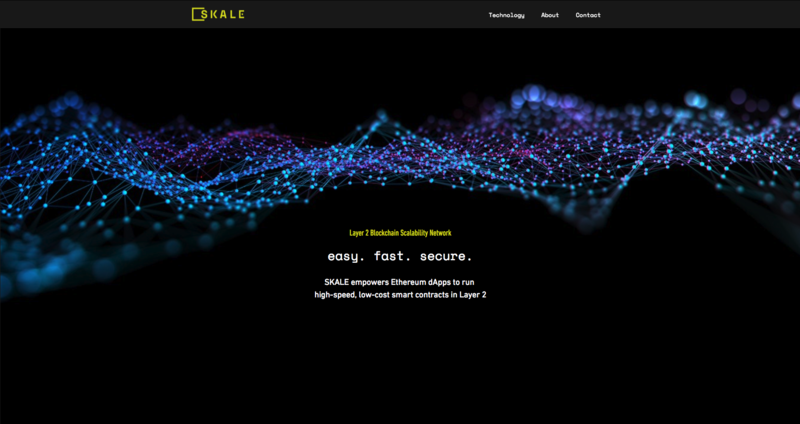 Having recently raised $9.65 million in a round led by Multicoin Capital, SKALE Labs is one of the more well-capitalized projects in the Ethereum ecosystem. The team is currently in the process of setting up the SKALE Foundation, which will take control of all IP and capital and be responsible for assigning a group of governing delegates who will act on behalf of validators and developers. Governing delegates will not be remunerated for their efforts; rather, as key stakeholders in the network, they are expected to be economically aligned with the long-term success of the project. For the first year of SKALE’s lifecycle, the Foundation will also assist in coordinating rollbacks and hardforks if problematic situations arise. However, despite owning 10 percent of SKALE tokens, the Foundation will not be participating as validators for legal and compliance reasons. With block sizes capped at 8mb and one-second block times, SKALE validators will require significant investment in hardware. O’Holleran recognizes that these hardware requirements ostracize a certain part of the validator market, although they should not materially impact the number of chains that can be launched: each validator can simultaneously support up to 128 different chains. The full specifications for validator requirements will be released in mid-March. Similarly, the reward structure for validators has yet to be finalized, with the team currently working through several models, as well as taking inspiration from Ethereum 2.0, Livepeer, and a host of other protocols. Here, SKALE faces a tension between wanting to provide cost effective services and, as a system that leverages Proof of Stake, needing their SKALE token to accrue significant value in order to protect against malicious attacks. O’Holleran did note, however, that the team has settled on a finite supply schedule. Providing sufficient incentives for validators is also key for the scalability of SKALE’s S-Chains, with the network scaling linearly as more participants join. Due to constraints around token distribution, at launch, the majority of validators will be made up of VCs and professional validation shops, both of which satisfy accredited investor requirements. However, O’Holleran is conscious of the risks, both reputationally and logistically, of having a validator set dominated by a small number of venture capitalists. As a result, the SKALE team is working towards a compliant token sale for non-Accredited Investors in the U.S., while the Foundation will soon sell tokens for utility purposes to non-U.S. residents. In order to launch an S-Chain, dApp developers must stake SKALE tokens through the SKALE Manager. These tokens serve as rent, with deposits depleting over time as they are directed to validators as fees, while concurrently adding to the network’s security by restricting circulating supply. It remains to be seen how expensive rent will be, with prices expected to dynamically adjust based on token price and bandwidth capacity, but the team is conscious that S-Chains must be cost-effective for developers processing millions of transactions per day. Fortunately, dApp developers in the Innovator Program cohort will not have to purchase tokens themselves: alongside engineering resources, the Foundation will provide tokens to developers free of charge. While some observers may be concerned that Layer 2 solutions like SKALE’s S-Chains will siphon fees from Layer 1, thereby reducing main chain security, O’Holleran expects a Jevon Effect to play out, with improvements in scalability helping to drive adoption, and thus net net driving more demand for Layer 1. Nevertheless, O’Holleran acknowledges that the competition between reward structures will force core protocol architects to take the impact of Layer 2 solutions into account. The SKALE team is currently focused on providing scalability solutions for Ethereum, viewing it as the most vibrant smart contract platform and the home to the largest cohort of developers. However, the SKALE system has been designed to work across any protocol, requiring just three months to port across to competing systems. Could EOS (EOS) possibly overtake Ethereum? Bitcoin Cash Price Drops 12% to All-Time Low at $190, What’s Causing it?